Swedish fish = algebra ? 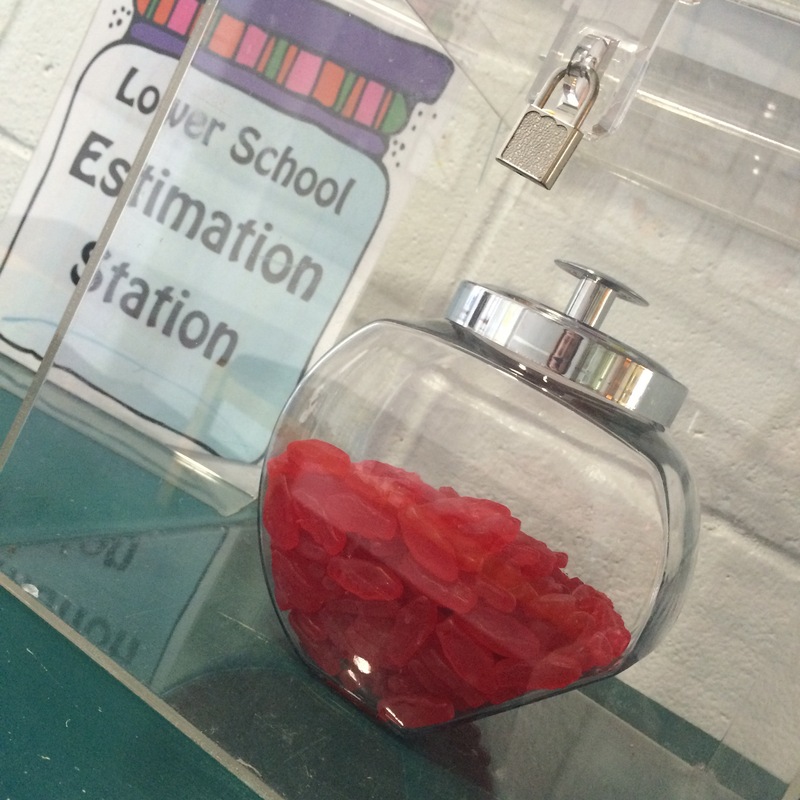 Every week, our Lower School has a fun estimation jar that lives just outside my classroom. Each week scores of kiddos waltz up and do their best to make an educated guess on the treasure of the week. Sometimes it’s edible, sometimes it’s bouncy, other times it’s practical. (Candies, rubber balls, erasers.) They squeak with delight as they count up the sides, across the top, trying to come up with the closest guess. Every Thursday, they wait with bated breath to see who wins and takes home the prize! So, back to math…Initially I though I would attempt to guess via volume-I did a bit of counting across and up. Then I remembered, I have the Internet. I guessed the approximate ounces of the jar, then used Amazon to figure out how many pieces per ounce. I was able to figure out a 2oz per piece (24), so I broke out some old fashioned algebra and, wait for it, solved for x. I guessed 30 oz. and determined that there were 360 pieces in the jar. I even used a pencil and paper. In retrospect, I think I have way overestimated on my ounces to create my equation. However, I am really proud that I, certified math-phob, used my resources and a little lesson from Mr. Schwartz’s class to make a reasonable guess. I believe this is the first time in 36 years of life and 13 years of teaching that I have practically applied algebra in daily life. All for the love of Swedish Fish. So, I wonder what I’ll see in the jar next week?